P&O Apartments S.L. - offers property sale and holidy rental on Costa del Sol in Spain. We offer you properties on Costa del Sol, Europe’s warmest region, where winter temperatures often exceed 25 degrees Celsius and the sun shines 360 days a year. If you are interested in acquiring real estate in Spain’s Costa del Sol we have a range of carefully selected, interesting offers. All offered properties have been checked and viewed by us in person. Looking for something exceptional? Do not hesitate to contact us and we will assist you in finding the right offer. We cooperate with local agents who will be there to assist you. It is especially now, when the Spanish real estate market is in crisis, that buying property here is worth looking into – after all its high season here all year round. If, on the other hand, you are among those lucky to own an apartment or villa in the Costa del Sol, we are available to search for tenants/renters and provide direct servicing of the property. Our membership to a unique Multiple Listing Service both via the Resale-online and the Infocasa Real Estate Solution enables clients to access details of thousands of properties which are available. This is not only extremely time saving for the purchaser but also an invaluable tool for the seller, as you now have access to most of the real estate companies on the coast and all of their offices plus your property can be viewed by all of their clients. This property sharing network is a proven system throughout the world and is now available through P&O Apartments S.L. on the Costa del Sol, giving you the best possible choice in addition to saving you time and money. Besides all of this, through us you can enter about 15,000 properties using our international database. With P&O Apartments S.L. you will always be accompanied by an experienced English , Spanish, French, Polish speaking sales negotiator and you will be assured of a professional full service system during all the phases of the buying process. P&O Apartments S.L. co-operates with a selection of European real estate agents as well as with local Spanish estate agents on the Costa del Sol. We always have an up to date database ensuring you are dealing with a professional service provider, who has a high standard of service and ethical basis. With P&O Apartments S.L. you will not only view properties, but you will also sample the Spanish “lifestyle” that includes a nice overview of the area, like, where are the best golf resorts, the most beautiful beaches, the nicest harbours and the cosiest restaurants for a lovely and relaxing diner? All these aspect can be experienced during your stay. Because we know that a purchase of a first or second home will be one of the largest investments you will ever make, we will accompany you step by step in this process. On our website you will find lots of useful information to help you prepare your future purchase. P&OApartments is an international company that offers total management service for both, tenants and rents for landlords, through the Internet. 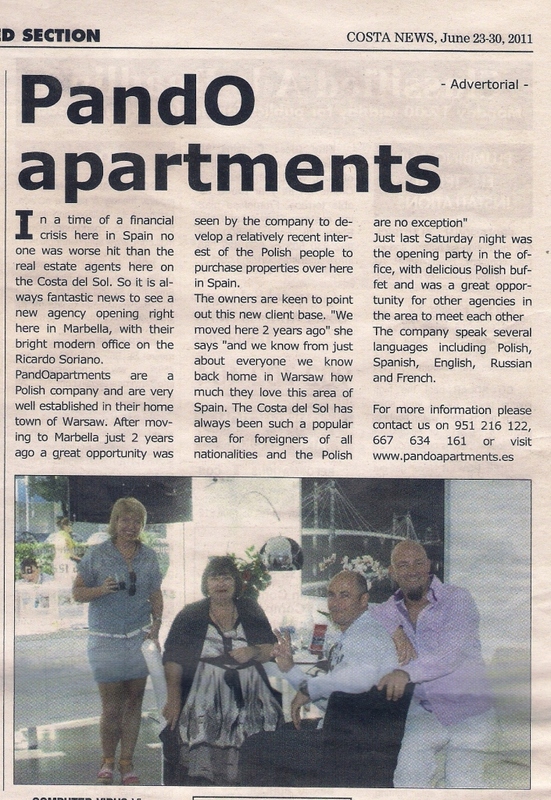 Our most common locations ranging from Spain (mainly in the Costa del Sol) to Poland : Warsaw and Cracow, (www.pandoapartments.es ) we service most requested apartments, and Manchester in UK (www.poapartments.co.uk). Our website www.pandoapartments.es has an excellent ranking in Google, GoogleMaps and many other search sites, in English, Spanish, Polish, French, Italian, etc.. Our search service for our customers tenants / owners work 24 hours a day 365 days a year in 7 different languages. Our apartments for rent is growing rapidly in Spain, mainly in the Costa del Sol, where we offer a wide variety of apartments, studios, duplexes, villas, etc.. Part of our team works in the area with the owners offering our services in the area. Include your apartment on our website is COMPLETELY FREE. - Advertising of your apartment 24h/daily and 365 days/at year in 7 languages. - A complete description y photo galery of the apartment. - All the conditions that you may deem appropriate (rental only in specific periods, the anticipation of a% of total price, key deposit, any prohibition like "no smoking", etc.). - Real-time information of each and every one of the offers that are received about your apartment and the ability to accept / reject. - Complete freedom: you can continue to seek tenants for your account without any charge. Are you an owner of a second home on Costa Del Sol ?. If you have a second home, private villa, apartment, flat, or townhouse you want to rent out, contact us to be included in our property rental list. P&O Apartments will be gladly of your assistance. We will be very happy to rent out your property for you and take care of the maintenance. To begin with, we would like to give you some items to consider, based on our broad experience on both fields. Once you have decided to rent out your property, we will come and visit your property and take you through the necessary paperwork. We will advertise your property on our web site and take care of the bookings and your tenants from the moment they arrive till the moment they leave again. We take care of cleaning the apartment and change of bed linen after the tenants have left and make the apartment ready for the new clients to arrive. All without you having to worry about anything! The only thing you have to do is enjoy the property when you are here yourself.